Music that is not perceived primarily by hearing. Research, practice, examples. This project started on August 1st, 2015 by Henry Lowengard. Let's find out how to experience music with other senses, primarily, the sense of touch. What waveforms, intensities and frequencies are appropriate for haptic music? Can haptic timbre be distinguished? Can haptic polyphony be distinguished? what are the best ways to create haptic instruments? haptic performance: playing for an audience. For this audience, I'm thinking non-aural hearing: haptic music. I bet this is something that would be really fruitful. Transducers that are customized for lips, tongue and fingertips (and erogenous zones?) might be good. Clearly, beated music with passages of interest running 60-300 bpm (1-5 Hz) are an accepted part of modern music, so What are the psycho-haptic perception curves? How high can this get? Is there a perception of haptic timbre? Can you perceive the music of other species (I'm thinking of whales and elephants) who communicate through low frequencies, if it is isolated and amplified through these transducers? And, having established the bounds of this haptic music, can we now leverage this to build acoustic instruments that can produce this music? For instance, if you hold onto a balloon - the larger the better, you can feel sound a lot better. This might work well enough so that an audience of some size, holding or kissing balloons, could enjoy a performance of haptic music. What if you constructed an acoustic resonating membrane for different pitches? It could then concentrate the sound of a low frequency horn, flute, or stringed instrument. Electronic instruments would be easier, but acoustic ones would be more corporeal (in the words of Partch). And there you go - ten minutes of thought about a music that is not about hearing. Gallaudet's DeafSpace This has some great architectural design ideas for making a better acoustic experience for hearing impaired people and also for their assistive devices. Furenexo is making little gadgets that set vibration buzzers off when there's a loud sound in the room. This project looks like it's disappeared, but it's an idea, anyway. But the real question is: can harmony as opposed to monophony be felt at a single point ? It there a perception of haptic "timbre"? Is there a way to actually enjoy this haptic music? There are certainly haptic pieces that are perceived as rhythm: dancing, hand clapping games, string games. I bet there's even a haptic component to sound games like the Inuit's Katajjiat. It would be a good start to take those hand clapping games and find a way to expand them to crowds, get "polyphony (different claps simultaneously), and maybe notate them. Fun Clapping has a number of these games on video! I did a fun little test and made this discovery: singing into a balloon I held in my hands, I could actually feel different parts of the balloon vibrating at different notes. This is probably related to the standing waves inside the balloon, and I think there may be a little more going on, in that a balloon is a resonator without a fixed volume or pressure, although there is a fixed number of molecules, and so it can be flexible with regard to where nodes and antinodes appear. It may be stabilizing as I feed it different pitches. In short, a simple balloon does almost exactly what the ORB is doing in Vocal Vibrations! The original video is on the left, and the motion in the right side images has been amplified. You can see the difference between the nodes on the ballon (nothing going on there) and the antinodes (ripples). I'm singing a short scale. Of course, the frequencies are way, way above the frame rate, but I'm hoping the aliasing will give a clue as to what parts of the balloon are moving. I may continue this with a more controlled sound source! I brought the AT&T Deathstar balloon into my apartment to see if I could get some more interesting results. It's really just a big white balloon with the shadows of my venetian blind at sundown. I'm playing (probably distorted) sines from my iPad and this is from about 116Hz to 124Hz. I'm also wondering if the same kind of research could be done with a mylar balloon, which is a lot less stretchy, but holds the air more air-tightly, and you could also bounce laser pointers on it to magnify the vibrations in real-time if you wanted to see them. Also, the research team that developed this has a 2200fps camera, which would clearly show the distortion a lot better! A more obvious frequency detecting approach would be to create a kind of panpipe that you can hold or wrap around your forearm that will respond to vibrations in a similar way, or a stiff but flexible conical shape which could act like a cochlea, creating predictable standing waves. The late Dr. Oliver Sachs' book Musicophilia may have some insights into the brain processing of music, and music perception: here he is lecturing about it. This may be a good way into haptic. 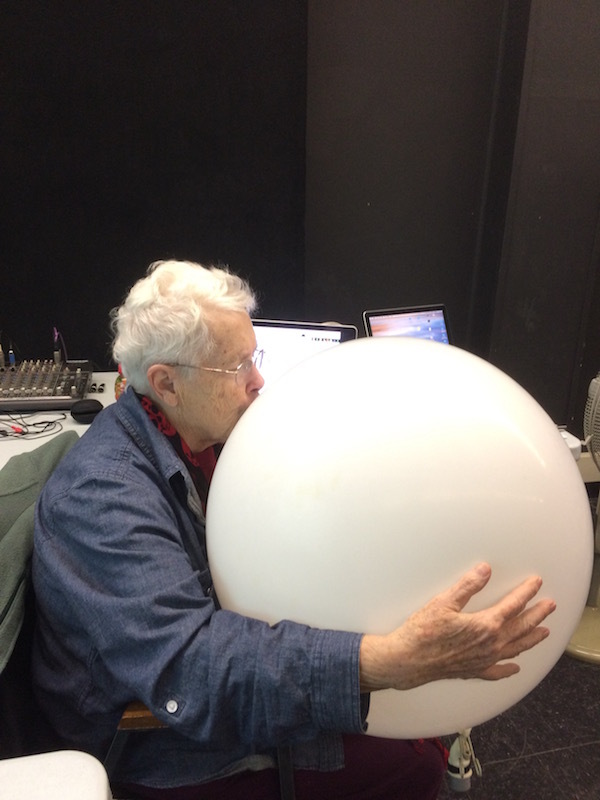 In 2015, I was invited by Dr. Pauline Oliveros to give a talk to her seminar in new performance instrumentation (NPI) at Rensselaer Polytechnic Institute. I presented some of the ideas that are here on this site, and blew up a lot of big balloons. Here are some Notes for my talk at RPI about what could be a musical experience without sound. In 2017, there was an open call for residencies at Olin College for people a little out of the ordinary to do research projects with their students. I put in for this - didn't get it - but here's the proposal, edited somewhat, of what I wanted to do, which was to work on this project. Thanks to all the people (Nancy O. Graham, Sandra J. Graham, Sarah Lowengard, Mary Lowengard) who helped me put this proposal together!